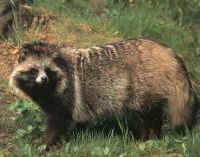 (Raccoon Dogs - Fur - 33) The skin of this raccoon dog is being pulled and cut off the head. We don't understand why humans think that it's beautiful to wear fur. All it does for us is show us how truly hard of heart and soul the person really is.